Get your tickets for the 6th Annual Hall of Fame Induction! Our new Hall of Fame inductees will be introduced at a cocktail party celebration on Saturday, November 3rd at The Yale Club from 6:00 – 9:00pm. 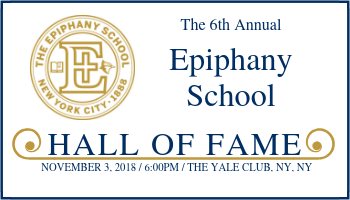 Our Hall of Fame Induction is a very special event where we honor members of our community who have contributed to The Epiphany School in meaningful ways. Proceeds help fund tuition assistance. Click HERE to Purchase Tickets or Make a Donation.